512 pages | 5 B/W Illus. Football is unquestionably the world’s most popular and influential sport. There is no corner of the globe in which the game is not played or followed. More countries are affiliated to FIFA, football’s governing body, than to the United Nations. The sport has therefore become an important component of our social, cultural, political and economic life. 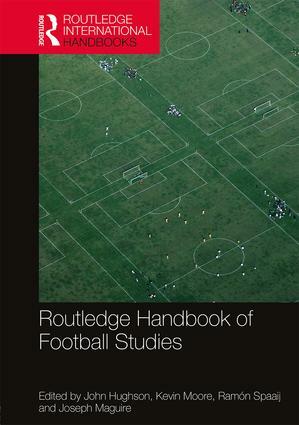 The Routledge Handbook of Football Studies is a landmark work of reference, going further than any other book in considering the historical and contemporary significance of football around the world. Written by a team of leading sport scholars, the book covers a broad range of disciplines from history, sociology, politics and business, to philosophy, law and media studies. The central section of the book examines key themes and issues in football studies, such as the World Cup and international competition, governance and ownership, fandom and celebrity. The concluding section offers in-depth surveys of the culture and organisation of football in each of the regional confederations, from UEFA to CONCACAF. This book will be fascinating reading for any serious football fan and an essential resource for advanced students or scholars undertaking research in football or sport studies, and any practitioner or policy-maker working in football. John Hughson is Professor of Sport and Cultural Studies at the University of Central Lancashire, UK. His working partnership with the National Football Museum of England has involved him in a number of 'football as culture' projects and related public engagement activities. His most recent book is England and the 1966 World Cup: A Cultural History (2016). Kevin Moore is Director of the National Football Museum of England, UK. He is a museum studies scholar and was formerly a lecturer at the University of Leicester, UK. His numerous publications include Museums and Popular Culture (1997). Ramón Spaaij is an Associate Professor in the Institute of Sport, Exercise and Active Living at Victoria University, Australia, and holds a Professorial Chair in Sociology of Sport at the University of Amsterdam, the Netherlands. His publications include Sport and Social Exclusion in Global Society (2014) and Sport and Social Mobility: Crossing Boundaries (2011). Joseph Maguire is a Professor of Sociology of Sport at Loughborough University, UK. He studied as an undergraduate in London and gained a B.Ed. (first-class honours) from the University of London, UK. He completed his Ph.D. in sociology at the University of Leicester, UK. He is a two-term former President of the International Sociology of Sport Association. He is also currently an executive board member of the International Council for Sports Science and Physical Education and Velux Visiting Professor at the University of Copenhagen, Denmark.